It took UFC Bantamweight Champion Amanda Nunes a mere 48 seconds to put a halt to the highly anticipated return to the Octagon for former Champion “Rowdy” Ronda Rousey in the main event of UFC 207. Whilst the nature of the loss may have a detrimental impact on her future inside the Octagon, it may in fact be the catalyst to kicking off a career inside the Squared Circle. Ever since she made the appearance at WrestleMania 31 and judo tossed Triple H, speculation began on just how soon it would be before we got to see her on WWE TV more regularly. Add to that the fact that the McMahon family (Stephanie in particular) have made no secret that they would welcome the former UFC Champion to the WWE with open arms. Sprinkle in Ronda’s statement on the Ellen DeGeneres show in November that #UFC207 would be one of her last fights irrespective of outcome and the foundations are firmly set. The main question that needs to be answered though is whether or not Ronda will walk away from the UFC following two back to back defeats. She has been competing at the highest level of sports since she was 11 years old and you can’t just lose the desire to win overnight. Whilst those two knockout defeats would have both hurt physically, you can guarantee that the emotional damage is far more harrowing for Ronda. There is no question that she would be warmly received by the WWE Universe if she made the decision to fully commit her future to professional wrestling. Just look at what a brief 10 minute stint at Mania done to the seventy six thousand fans in attendance and the millions, and millions of fans watching worldwide on the WWE Network (Sorry need to channel my inner Rock). If she thinks that losing an MMA bout is going to have any impact on her reception in the wrestling world then she needs to look no further than the WWE/MMA career of Brock Lesnar. Lesnar competed and captured the UFC Heavyweight Title in just his fourth MMA bout and went on to defend it twice. He then suffered back to back TKO losses before returning to the WWE in early 2012. Lesnar was the baddest man on the planet before, during and after, proving just how important character is within the professional wrestling world. It simply doesn’t matter what happens outside of the wrestling bubble, as long as you maintain your character when the wrestling fans are watching you. The women’s WWE division definitely has place for a new character and someone with the star power of Ronda Rousey would make a welcome addition. It is probably unlikely that Rousey would commit to a full time WWE career, she has over interests outside such as films etc which I suspect she would not be willing to give up. Therefore I suspect that if we are to see her as part of the WWE roster it will be on a “Brock Lesnar schedule”, appearing at big PPV’s and the odd Raw/SmackDown show when needed. For someone coming into the industry green as Rousey would be, you could argue that she should be learning the ropes and travelling the roads to really appreciate the lifestyle of a professional wrestler. But I would argue that given just how much of a polarising figure she is, the WWE should go out of their way to get her across in whatever contract works for her. Right now her future is going to be the last thing she is considering as she comes to terms with the devastating knockout loss. 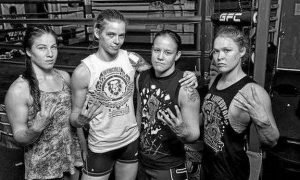 As a fan of both Ronda and the WWE the prospect of them working together is a very exciting concept but one that only Ronda will be able to make a reality if she is going to call it a day with her MMA career.